The removal process of Derby Silk Mill’s James Harrison of Hull’s clock. 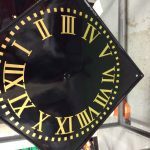 This clock will be carefully restored by our apprentices under the guidance of turret clock and Harrison specialist, Chris McKay. This video looks back at our 160 year story of clock-making. Filmed and edited by Nicholas Whitworth, 6th Generation, Smith Family. Watch this touching short video as Jonathan Lee, one of our clockmakers takes you through a typical day. Jonathan has been with us for 47 years, he started in July 1970 for John Smith & Sons. A pleasure to watch a craftsmen at work. A 60 second tour through the skills and values of our 160 year old family company. Church dial restoration, Ecclesiastical clocks. Shows the process of church clock dial removal and replacement on the tower of St John the Baptist Church, Sampford Peverell, Devon. The film includes a detailed account of the process of re-gilding a dial in our Derby workshop. Thanks to Dave Hennings at Connigar Productions for videography. 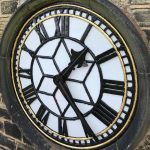 Footage of the restoration of the clock faces of St Mary Magdalene Church, Hucknall. Pallets and escape wheel teeth mating together in harmony.